What’s going on in Brandenburg? You probably wouldn’t ask this question, but here’s the answer anyway: nothing! If you don’t speak German, this song basically says Brandenburg is an empty land with nothing interesting going on! Now I don’t know how true that really is, but to me, Potsdam, the state’s capital, definitely deserves a place on my top 10 must-visit locales in Germany! Brandenburg is one of Germany’s 16 federal states; it surrounds the city-state Berlin and has a vast area of nothingness greenery. I knew little about this federal state besides the six Brandenburg Concerti Bach has written. I didn’t even know Potsdam was its capital although I had already been there twice! Potsdam is only around 30 minutes by train from Berlin, so much to my embarrassment, I had thought for the longest time that it was part of Berlin, or just a small town outside of Berlin. You can’t blame me – the place looks more like a Disney-inspired village than a state capital. Nauener Tor – doesn’t it look like some Disney castle’s gate? 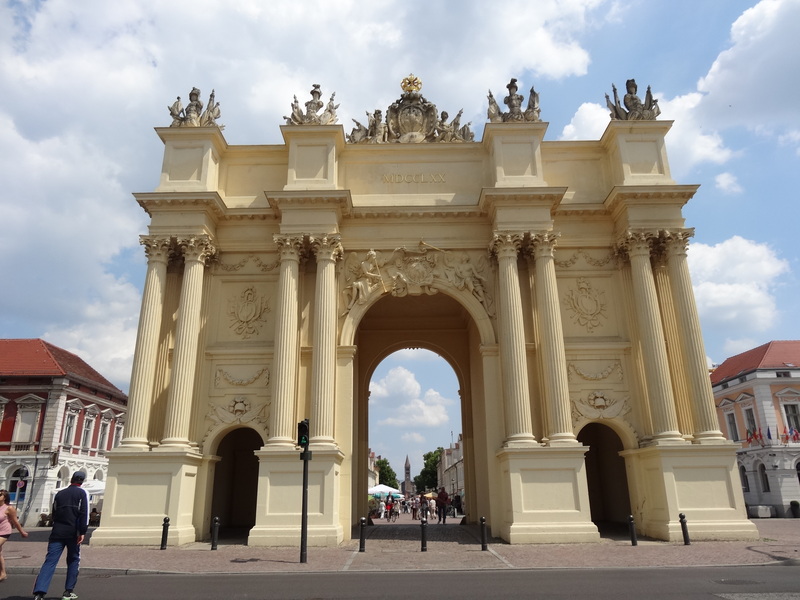 Unlike Berlin, Potsdam remains a beautiful Baroque town and is often described as Germany’s Windsor. There are a number of palaces and castle gardens that are worth-seeing, but it isn’t easy to see everything within a day because the attractions aren’t very centralized and it’s hard to walk around on a hot summer day. The most important palace in Potsdam is Schloss Sanssouci. The Rococo palace used to be the summer palace of Frederick the Great, King of Prussia. Sanssouci is a French expression that means “without worries”, which pretty much states the castle’s function: relaxation and enjoyment. There is an enormous park (or several gardens, I’m not even sure – trust me when I say the place was huge) around Sanssouci. It takes at least a few hours to walk through it and visit other houses, palaces and orangeries within the garden. The first time A and I went was on a snowy day in February, which was practically torture. So try to go at a warmer time! If you leave the park from its southeast entrance, you’ll reach another Brandenburger Tor (the more well-known one is in Berlin) after a five-minute walk along the street. Standing proud on Luisenplatz and guarding the main street of Potsdam, Brandenburger Straße, this smaller, sweeter version of the gate was built by Frederick II in 1770 as a symbol of his victory in the Seven Years’ War. Can’t get enough of gardens and castles? Head northeast to Neuer Garten. It’d be nice if you have a bike otherwise you’ll have to take a bus like Leona and I did to get to Schloss Cecilienhof. It’s not the most convenient location for tourists but it’s worth a visit. The castle isn’t your typical elegant (but somewhat boring when you’ve seen a dozen already) baroque palace. It’s much simpler than other palaces around and reminds me of the traditional fachwerk houses although it was designed in the style of an English country house for the Crown Prince Wilhelm and Princess Cecilie. Most importantly, Schloss Cecilienhof was where the Potsdam Conference was held in 1945, and was then used by the Soviet troops as a clubhouse. Coming back south you’ll pass by a Russian Colony called “Alexandrowka”. Frederick Wilhelm III created this village with unique architecture in memory of his deceased friend Czar Alexander I. A Russian soldier’s choir became the first inhabitants of this village, which consists of 12 yards, a Russian Orthodox chapel and special farmsteads. Continue south along Friedrich-Ebert-Straße and you’ll eventually get back to the historical center, where more interesting sites that you can’t miss gather in the Nördliche Innenstadt. East of Nauener Tor is Potsdam’s Holländisches Viertel, said to be the biggest collection of Dutch-style houses outside the Netherlands in Europe, with around 150 red brick houses built between the years 1734 and 1742 for the Dutch craftsmen that were invited to live there by Frederick Wilhelm I. Right next to the Dutch Quarter is another historic structure – the Catholic Church of St. Peter and Paul. Built from 1867 to 1870 and restored in 1950, it marks the eastern end of Brandenburger Straße. If you still have time, check out the classicist-styled St. Nicholas’ Church on your way back to the train station. Sitting quietly yet gloriously on the Alter Markt, the Evangelical church has over 180 years of history despite its clean look and was built 30 years prior to the construction of the Church of St. Peter and Paul. Now you know what to see in Potsdam, have fun exploring!